It’s a Saturday night in Brooklyn in 1929, just before the Stock Market crash. Gene, who is an underling at a Wall Street firm, is sitting on the family porch with his young middle-class bachelor buddies, all itchy and restless because they have no dates. Gene’s father is conveniently away. The young man boasts of his schemes and dreams for a life in high Manhattan society, though his friends are content to stay in Brooklyn. Gene attempts to crash a dance at the Plaza Hotel, and in the process meets someone he believes to be a fancy Southern debutante. Much to his friends’ surprise, and to her own, he announces that he plans to marry her. It turns out ultimately that Helen is just another gate-crasher, also from Brooklyn. Gene’s plans to get rich quick lead him into a narrow brush with the law. Nevertheless, the show ends, predictably, with an optimistic finale promising prosperity and domestic bliss for Gene and Helen. 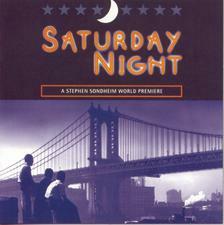 Saturday Night, with a book by Julius J. and Philip G. Epstein, based on their play Front Porch in Flatbush, would have been Stephen Sondheim’s first Broadway show had it opened, as scheduled, during the course of the 1954–55 season. But when its producer, Lemuel Ayres, died suddenly, the project was shelved. After Sondheim achieved notoriety as the most important composer of his generation, songs from the show began to surface in compilations and tributes of all kinds, but it wasn’t until the Sondheim Society staged a concert version at the University of Birmingham that it got its first official presentation. Directed by Carol Metcalfe and Clive Paget, Saturday Night opened at the Bridewell Well Theatre on December 17, 1997, and closed the following January 24, after playing 38 performances. A New York version played at the off-Broadway Second Stage Theatre from February 17, 2000 to March 26, 2000, under the direction of Kathleen Marshall.